The Lodge and Spa at Brush Creek Ranch in Saratoga, Wyoming is a luxury dude ranch on 30,000 acres of wilderness, and is a perfect spot for a rustic, country wedding. 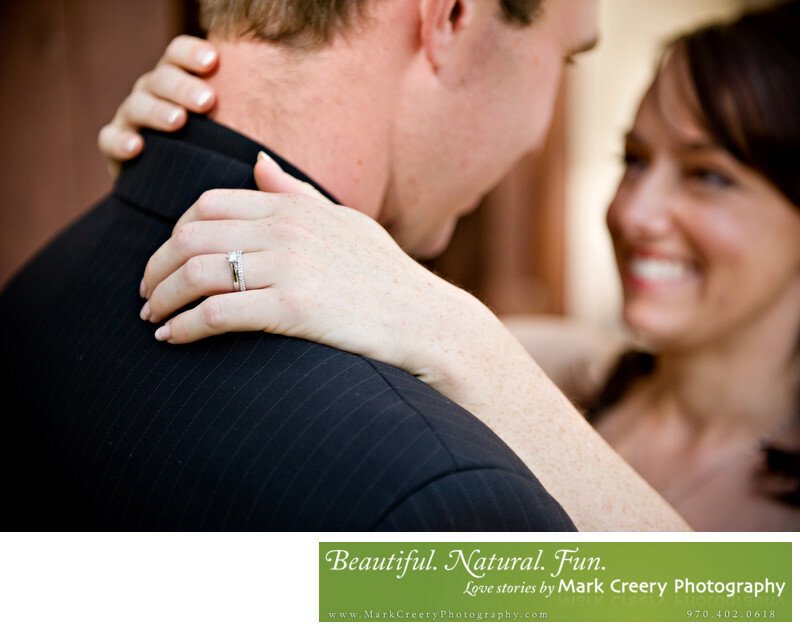 Mark Creery Photography is a wedding photographer that serves southern Wyoming and knows how to capture the essence of a ranch wedding and people's personalities. The wide open sweeping landscapes of the area and big blue skies are a sight to behold. Guests have a wide variety of activities to choose from during their stay, including fly-fishing, archery, and horseback riding, which ensures that they will remember their visit for more than just the wedding. In this wedding photograph, I chose to focus in on the rings as the bride and groom embrace in a private moment. I used a shallow depth-of-field using a fast lens to allow the viewer's eye to be drawn in, while still showing the bride's happiness. Brush Creek Ranch is located in Saratoga, Wyoming. Contact: Amanda Wascher and Corinne White, sales@brushcreekranch.com, (307) 327-5284. Location: Brush Creek Ranch, Saratoga, Wyoming.